Editor’s Note: This review was updated on July 12, 2015 to add impressions of the production run Colt. All famous Colts, for one reason or another. And while an outdated subcompact, malt liquor and firearms, and a college football hero-turned-NFL also-ran stand together as dubious company, there is a new product in town to save the family name and return it to respectability. Say hello to the Innova Colt. It is sleek, slim, and ready to take aim at a basket near you. The Colt shares a similar shape and feel to Innova’s Classic Roc. It has a tremendously low profile that fits well in both a power grip and a modified fan grip, with a medium-sized bead to slow the disc’s wear pattern. Where the Colt differs from the Classic Roc, though, is in the lower portion of the disc’s wing, where it fans outward in a rounded, convex fashion. This lower wing has been a staple of recent Innova designs that the brand calls VTech. The profile “provides extra torque resistance, making it suitable for sidearm and windy play,” according to the brand’s marketing materials, and I have to say I agree. In fact, I agree with everything Innova says in its advertisements thus far about the Colt. Have I been drinking too much of this mold’s namesake, perhaps? Has Innova’s generosity in providing these discs to review clouded my judgment? No. It’s just an excellent disc. As long as it feels the same in the hand, I’ll continue to swoon. The shallow profile, which resembles a squished Discmania P1x, is my favorite part of this disc. The DX had a slight dome to the flight plate, but the XT came board flat. Both discs, as opposed to their deep dish predecessors, have a more modern feel that seems to be meant more for speed and driving than actual putting. It’s no wonder, then, that Innova assigned a Speed 3 categorization to the Colt; it lives in the same house as the Dart and Wedge, as opposed to the old school dwelling of the Aviar family. That said, the Colt shines for putting duties in the 10-meter circle, despite its speed. I tend to prefer the slimmed down feel of a disc like the Colt, because I can get a cleaner release for long putts. It also gives a bit more speed to the basket, which I can use on a spin putt for straighter shots. Even on downhill putts, the Colt is so straight that it is easy to remain confident. And straighter shots is where the Colt makes its money. Out to 30 feet, this disc has zero fade. I felt supremely confident aiming for the center pole and letting it fly, and more often than not, it would cruise to the chains. 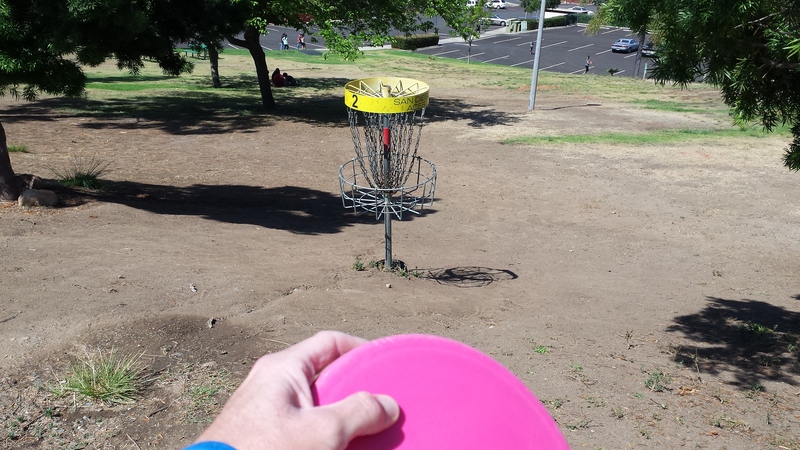 Occasionally, if I rolled my wrist, it would take an anhyzer and dive away from the basket, but that’s my issue. Plus, I found a way to use the fact that it likes the anny line: On intermediate hillside approaches, I can trust the Colt to take the line and sit down without rolling away. From a plastic standpoint, I found the DX to have a bit more glide, as Innova advertises. As a result, I’d be comfortable using the DX Colt for putts outside the circle, as the extra legs help. The XT takes a little more oomph to get there at longer ranges. Putters are a very personal fit for every day putting duties, though, so I like to put more of a focus in my reviews on how a mold flies for drives and approaches. Even if someone might not be able to break up with their favorite circle putter, driving putters – for me at least – seem to be more fungible. And as far as driving putters go, the Colt provides an excellent balance of distance and control. With the ability to shape and hold numerous lines, it is surgical in nature. Because of its enhanced durability, I focused on driving the XT Colt. Initially, it took me a few throws to really unlock its powers; with turn and fade numbers of -1/1, I was expecting some wiggle, rather than point-and-shoot laser beams. I had to put its torque-resistance claims to work early on to get it to hold an anhyzer line – which it did, with some flex at the end – and couldn’t manage to flip it to flat from a hyzer. A couple tree hits and about half a round of throws, though, and the XT broke into a dream machine. Hyzer flip to flat? Check. Anhyzer to the ground? Done. Full power hyzer lines for distance? Yep. Pick a line, and the Colt can handle it. It even takes a nasty forehand flick on get-out-of-trouble approaches and turns them into smooth upshots. Even still, with its ability to hold numerous lines, it still retains the ability to jam reliably straight. I used the Colt to play catch with a buddy, and there were quite a few throws where we literally did not have to move to catch the disc. It went right where we put it. Oftentimes, when a putter displays this kind of high speed stability, I have trouble powering it down because the fade will be too hard. This is not the case, though, with the Colt. In fact, one of my favorite shots with the Colt has been with a powered down, modified fan grip. I’ll place my middle and ring fingers on the underside of the flight plate, with my index gently hugging the rim. With this grip, I can toss the disc low and gain predictable approaches or – as is my preferred method – induce an intentional nose-up stall shot for a gentle fade. These low speed shots came in handy a few times during a recent round at Pier Park in Portland, Oregon. I had to work a few gentle lines around some trees, and the Colt held true without fading out too hard. The XT Colt tries to find some shade at Pier Park in Portland, Oregon. With two plastic blends available for the Colt, I understand it might come down to one or the other for some throwers. And really, it depends on what you’re looking to do with the disc. If you are using the Colt solely for putting, DX is the way to go. It has a nice amount of glide, but the durability of the base plastic leaves it less than desirable in a driving or approach role. On the other hand, if you want to do it all with the Colt, go XT. It has slightly less glide out of the box, but after a few rounds it has caught up to the DX in that department. It has tremendous grip, handles power well, and the longevity of its flight characteristics is impressive. Case in point: I threw the Colt, full power, into a tree about 30 feet off the tee. It temporarily warped the rim, and bulged the flight plate a bit (which is why I suspect it was retooled). That said, it flies exactly the same as before, and even stands up tall in a headwind when given some hyzer. 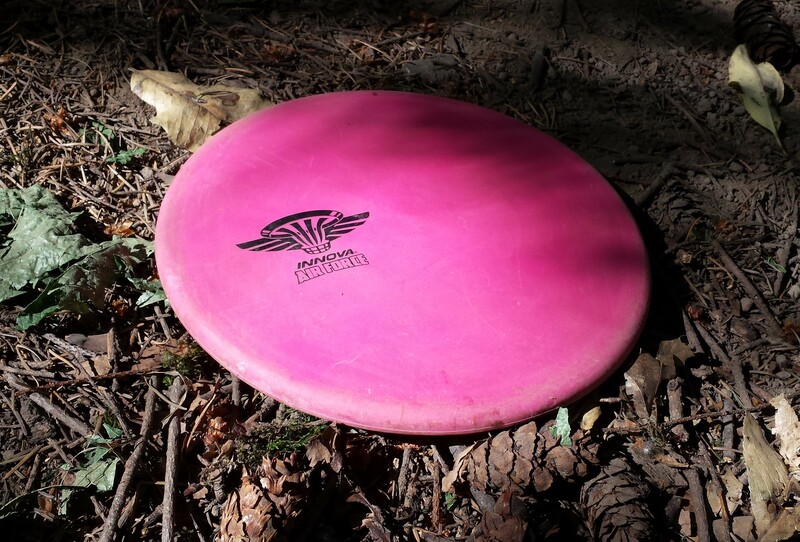 Much like other plastics in this class – MVP’s Electron and Latitude 64’s Zero Medium come to mind – it may take a beating and not look so pretty, but it still flies like it should. As a leader in the game, Innova doesn’t have much to prove anymore, in my book. But, even with all of its success over the years, it can still impress, and the Colt is proof in the pudding. Bold prediction: This Colt stays popular longer than its namesake vehicle and NFL quarterback. If it can hang with firearms and malt liquor, it’ll be truly immortal. Update: I received three additional Colts from Innova this week, all of which come from the retooled production mold. Dunipace’s assertion that the company enhanced the flight plate holds true. There is noticeably less flex toward the rim like there was before, with a slight roundness to it. The profile still has a shallow feel, with the XT continuing its trend toward pancake flat and the DX still possessing a mild, gradual dome. The crown jewel of these discs, though, was the GStar Colt Innova decided to toss into the mix. It flies a bit more true to the -1/1 turn and fade numbers out of the box, almost as if it is worn-in prototype. It doesn’t have quite the glide that the XT does, but I imagine that this will change with use. No need to shake the new off the mold to get it flip up and fly straight from a hyzer release. High-end plastic means the flight will remain unchanged for longer. All told, Innova hit the retool out of the ballpark, so I don’t feel a need to recommend stocking up on the prototype Colts if you were in love with them. If it says Colt, it’s good to go. 4)SHARE the review – either on Facebook or Twitter – for an extra entry. The contest will run until Thursday, July 16 at 9 p.m. PDT, when three random winners will be chosen. Good luck! I’d really like to win a colt!